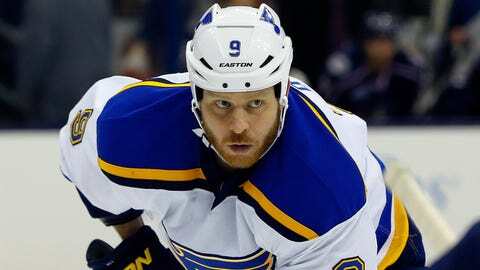 Steve Ott missed the Blues' game Saturday to be with his wife and newborn son, Maverick. ST. LOUIS — For professional hockey players, there’s only one reason to happily miss the chance to play in a game. On any other day, Steve Ott would have joined the rest of the Blues for their morning skate and a tough game Saturday night against the Pittsburgh Penguins. But the organization and the veteran forward both agreed that wouldn’t be feasible after he pulled an all-nighter to witness the birth of his second child and first son, Maverick, less than an hour before St. Louis took the ice Saturday morning. "I think everybody knows that whoever has a kid, in this dressing room or in the world, there’s not a better feeling," Ott says. "There’s nothing that can relate to that moment when you get to meet your child for the first time." His wife, Erica, actually went to the hospital during the Blues’ 5-1 win over Boston. After playing nearly 10 minutes and delivering three hits, Ott quickly grabbed a change of clothes and headed over to Mercy Hospital. He returned to practice Monday, where he received plenty of congratulations from the group of players and coaches he calls his "second family." But they understand his real family comes first, and Ott left practice to resume his fatherly duties by picking up his wife and son at the hospital. As for the name, Ott explained Erica is from Dallas, and when she suggested using the nickname of the pro basketball team, he quickly agreed. Of course, they’re both well aware of the connection to the hit television show that ran from 1957-62 and the famous Tom Cruise character from a classic 1986 film. "I’m going to pretend that it was about Top Gun, and I’ll be his wingman," Ott says. "Momma doesn’t think it’s too fun, but I think it’s hilarious." Ott says he’ll be "Iceman," so if he can just find his son some friends named Goose and Cougar, they’ll be all set.